Pneum pressure vessel mixer and conveyor, without compressor. 3-cyl. DEUTZ-Diesel engine 35.5kW, oilcooled. Volume 260 l , working volume 220 l depending on material. Mixing and conveying of semi-dry LC- and ULC- refractories up to aggregat size 8mm (5/16). Vessel with mixer and drive,skid machine frame with crane hooks and forklift pockets, electric control box, grease tool, tool set, standard vessel outlet ID65mm / KKV89. Blow-back-device, autom central lubrication, conveying hoses ID65mm/KK89, mains cable. From 4 m3/ min, 7 bar. 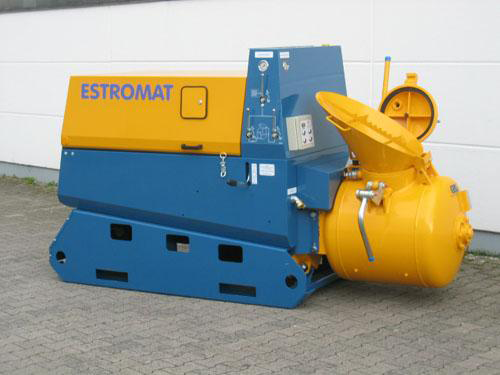 ESTROMAT 264 E-ST, ESTROMAT 165E automatic.